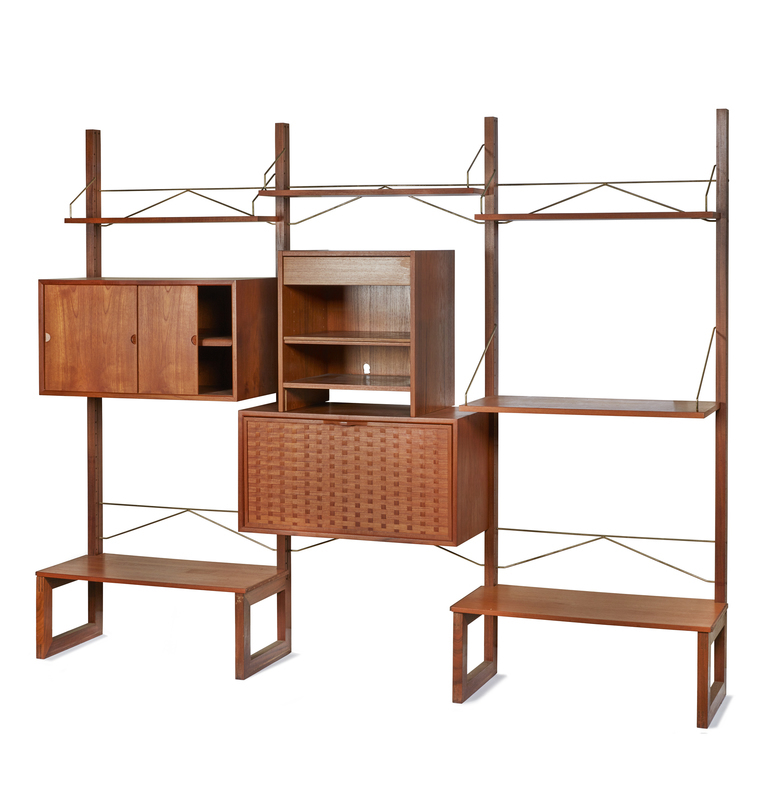 A mid-century Danish modern wall unit with multiple shelves and three different large storage sections including a set of open shelves topped by a drawer at the center; a large central compartment with a hinged pull-down door front decorated with patterned inlaid wood; and sliding wood panel shelf set at the left side. Also includes brass-like wire structural elements. The lot also includes two loose shelves which go with the unit. Dimensions: approximately 77 1/2"h x 94 3/4"l x 16 1/4"w. For delivery quote, please contact Box Brothers Sacramento at boxbrosacto@gmail.com. Minor wear to be expected with age, but overall in very good condition. Witherell's strives to provide as much information and photographs as possible but encourages in-person inspection by bidders. Condition statements are only for general guidance and should not be relied upon as complete statements of fact and do not constitute a representation, warranty or assumption of liability by Witherell's. All lots are sold "AS IS" under terms and conditions. Please be advised we do not furnish packing materials nor porters for pick ups.